The bony bumps you can feel at your ankle are actually the lowest parts of the tibia (inner) and fibula (outer). During ankle fractures, one or both of these bony bumps will break off. Dr. Reddy will first check the bone fragments for stability to see if they will heal on their own. 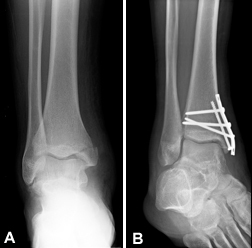 Ankle fractures almost always need surgery to heal. Dr. Reddy would make a small cut over the broken bone and drill screws into the bone fragments so they stay connected. After surgery, you will need to stay off your ankle for 3-4 weeks, followed by a few weeks in a walking cast and physical therapy to help regain your strength to get back on the field.